What do you do when you have one of those no news is good news kind of weeks? I consider them akin to birthdays: the alternative is worse. So how do I navigate my way through a ho-hum week? Besides putting on my walking shoes each morning, and showing up at the office, I cook. Well, we have to eat. I’ve declared several times this is not a foodie blog but it’s hard to keep food out of it, as I’m a devoted, if amateur in execution, fan of food. So, yes, my Dad is a fisherman, or at least he was when I was a kid. Enigmatically, now retired with more opportunity, the attraction has waned… I’m still coming to grips with the snippet of information conveyed to me earlier this week that Dad’s taken up strumming a guitar. But once upon a time, at every chance, Dad fished: at the beach, lakes and rivers. He is a authentic fisherman, has all the gear, casts his own lead sinkers, and sources bait from local nature. Fishing meant camping because it was only in my teens we acquired a caravan, which was old and small, so even still it meant camping. We went on holidays when and where Dad wanted to fish: Hawks Nest, Sawtell, Lake Keepit, Lake Glenbawn, Manilla Weir. He also established and became President of the Murrurundi branch of the district fishing club, so we regularly made trips to Ebor Trout Hatchery to obtain fingerlings for restocking of the Pages River. The corollary of this is we ate quite a bit of fish. There wasn’t (& still isn’t) a fishmonger in our small country town. Fish was self-caught unless battered by the café. As a family we continue to be partial to fish, and Dad & I select similarly from a piscatorial menu. At a family gathering, he’ll get Tailor (Bluefish) especially for the two of us, to the customary abhorrence of the others, who for reasons unfathomable consider it unpalatable. Fish and Dad will always be linked, and I’m thankful for this legacy because it means I’m an enthusiastic and unfussy fish eater. Bones, no problem, I deal with them as instinctively as my nose knows when the fish is cooked just so. Yesterday when considering quick mid week dinner options, I’d run low on food and ideas so I made a dash in my lunch break to my regular De Costi’s where the fishmonger resembles Jerry Orbach from the TV series Law & Order, in search of dinner. Score = Blue Eye Cod fillets. 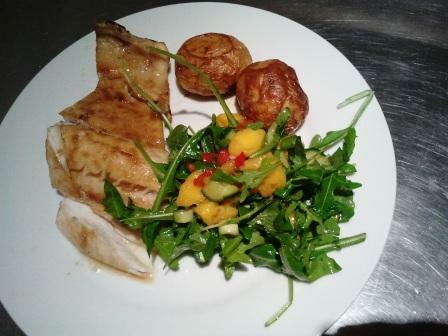 Sydney’s warm spring weather lent itself to my habitual combination of baked fish and mango salsa. In the fridge were leftover baked potatoes and the makings of salsa, so I grabbed a bag of rocket from the greengrocer to complete the deal. And yes, I did go with a light sprinkle of ginger powder, sea salt, raw sugar & white pepper onto the fillets lightly sprayed with rice bran oil. The 2 fillets (510 grams) went on to a preheated tray into a very hot (250 degrees Celsius, approx. 480 F) fan forced oven for 10 minutes, along with the pre-baked potatoes for 5 minutes. The salsa is chopped mango, red capsicum, Lebanese cucumber, shallots, tossed with olive oil, balsamic vinegar, and a pinch of sea salt. This entry was posted in Blog and tagged Australia, family, food, humour, my life. I love fish, but it has to be totally filleted, one hint of skin or bone, and the dogs end up with it. The dogs do well from my dislike of skin & bones 🙂 even down to the tiny bones in tinned sardines. It is also another reason why I rarely have fish and chips from anywhere else other than Yorkshire (nearly always totally filleted). I love the taste, but a bit too finicky picking out the bones from a fresh one, I can’t cope with the head left on either, so usually end up with a pre prepared meal. Oooh, I’ve been looking for how to make Salsa, I really want to make some. Thanks for the story, loved it. Yum! I’m ashamed to admit that we eat a lot of frozen fish, no fishmonger in our small town. In the murky past the Man and I used to live right on the river and would wander off with fishing rods after work to catch dinner many nights of the week. We aren’t very good but when we met with success it was the same as you, wrapped in foil with butter. The skin comes off easily that way too. I love those frozen crumbed fish too and so do the kids, thankfully. We probably eat far more of them than is good for us but after work I am in no mood to do a big meal that’s for sure! I am so glad you shared this recipe, EllaDee, as well as the pointers for making salsa. I don’t know if I’ll ever find Blue Eye Cod but I’ll think of something. It’s your use of ginger and sugar that i can’t wait to try. It is so unlike anything to which I’m accustomed. Yes, you certainly do come from a fishing background. Your Dad sure did love to fish and I enjoyed reading about him. We ate a lot of fish, mostly on Fridays (Catholic, you know!) but little of it, if any, was caught by a family member. Grandpa knew where to get the Italian delicacies and Dad, working at a restaurant, took care of all of the rest. Looking back, it was quite a diversified menu especially by today’s standards. Everything now seems to be tilapia and salmon, both great fish but I want a variety. And like you, bones aren’t a problem. It’s all about freshness and taste; they go hand-in-hand. Thank you, too, EllaDee, for your kind words in reference to my blog. They weren’t at all expected but definitely appreciated. Loved this post. Lots of fish history in my childhood, followed by 5 years in a fish factory in Iceland. And then 10 years of restaurants with fish,calamri and prawns featuring heavily on the menu. But the sugar, never done that before. Going to give it a go. The salsa sounds great too. Can’t wait to try it. Thanks also for the Bartolini Kitchen link. What a great blog! Am going to relish it. Have just been given a gift called “A week In The Kitchen” – Karen Dudley – based on her Cape Town venue. Check it out if you can – I am sure you will love it – . Despite being vegetarian I could probably write endless fish posts. When I wasn’t (veg) it was the last thing to go. I did write about it on Clouds, but I don’t want to cast a damper on the fishy proceedings so I won’t give the link. A used to fish in Aus, and my grandparents had a fish and chip shop. So, my mother could make perfect battered fish. In fact when she cooked it, she probably thought she was in a fish and chip shop as my dad and I would just continue eating until she stopped cooking. I ate very different fish to you though – when I unmothball Clouds, I’ll try and remember to write a fish post. I just read Gina’s Mallet’s Last Chance to Eat, and the info on fish is challenging to put it mildly… as you now I do the best I can with what I’ve got to work with… I love the image you paint of you & your Dad indulging in your Mum’s proper fish & chips, and what a wonderful vocation for your Grandparents 🙂 It’s funny, the G.O. who is averse to [run of the mill] ‘green’ is the reason, as well as my vege/now semi-vege sister, that I put together substantial stand alone vege dishes – vege has so many more wonderful ways than most people give it credit. Um I just visited the bartoloni cocina. It took ages to load 😦 I thought the pork loin recipe was interesting as I used to do that years ago except using prunes, and I seem to remember the gravy (from the juices) required a tiny drop of cognac. It was quite delicious, I even dished it up to an old-school friend who had gone into catering. I thought I would investigate the vegetarian section. Oh dear. 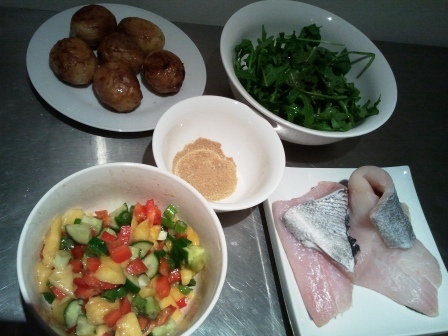 The sea bass made it into there….. Along with a few jams. * Precious vegetarian sigh * While I appreciate the gesture, I actually think non-veggies should leave the topic alone, especially as there are some seriously brilliant veg blogs out there, in particular the vegan ones. I digress. I didn’t comment, because I thought it would look rather churlish to hop over from yours, only to carp (haha witty huh!) about the categorisation of menus. Such restraint. I am now even more tempted to unmothball Clouds! It was interesting to write because, thinking about it, there is so much variety with fish, whereas meat is just pigs, cattle or sheep (more or less). You are right, vegan is so much easier. When we flew, I would order vegan food (saved getting egg mayonnaise followed by cheese omelette followed by cheese for dessert). I can live with people not being veg. I just flip when people get it wrong. Come of old age, impatience and intolerance (I know my faults). Fishing is THE BEST! I can’t wait to get back to Cairns so we can go fishing at the inlet – we usually throw in a crab pot or two as well (I love mud crab). I cook the fish differently depending on the size. If it’s pan sized I just scale it and fry it skin and all (the tail goes crunchy which is really nice). If it’s a bigger fish I’ll fillet it and steam it with lemon, garlic and butter. Oh no, I’m hungry now!!! “Fish and Dad will always be linked, and I’m thankful for this legacy because it means I’m an enthusiastic and unfussy fish eater.” This resonates with me . . . I am abundantly thankful that I am one of those who can eat almost any type of fish. It is loaded with essential oils, nutrients, and fatty acids that are so, SO good for you body. And I feel this way because my dad, too, was a strong advocate of fish. No fisherman, though. 😉 He introduced me very early on to many varieties of food, enriching my palate at a young age. Oh, and also, YUM! Ella, these dishes look incredible! Thank you. Dads influence us in all sorts of enduring ways – as I get older I realise how much I am my father’s daughter… mostly when my stepmother tells me so, when she’s annoyed at one or both of us! LOL — I hear that often, too!